Batik fabrics are made by using a wax-resist method of dyeing or discharging. For dyeing, hot wax is printed or painted onto the fabric, and the wax prevents those areas from accepting the dye. In the discharge process, the wax protects the fabric from bleach or other color-removing agents. 'Hello Darkness' 85' x 37.5' Cotton fabric, batiked, discharged and hand-quilted. $4000. 'Diamonds and Rust' 62.5' x 42' Cotton fabric, batiked, discharged and hand-quilted. $4000. 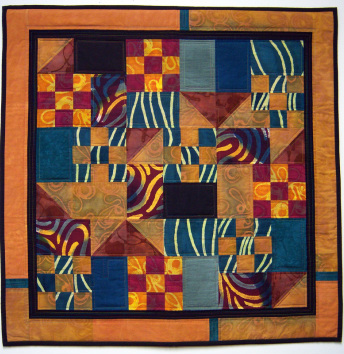 This quilt was featured at the HandMade in America designer house at The Ramble in Asheville, NC in 2008. "Rhyme or Reason" 37.5" x 37.5"
This quilt was made specifically for Focus on Batik (2004), a book written by my friend, Jan Smiley. In it, she covers the history of batik in various countries, unique characteristics of batik fabric, and projects that give easy-to-follow directions. The fabrics here are all hand-dyed cottons.